Sarah Thorp is the owner of Room 212 & puts on exhibitions workshops and events at Gloucester Road cafe bar gallery Alchemy 198. Both businesses are at the heart of Gloucester Road Central, run by Sarah and other traders; Glos Rd Central. Sarah is co-founder of 212 Productions, a fine art printing business. Sarah is a mixed media artist and sells her work at Room 212 . She shows her work on the North Bristol Art Trail for which she handles the press and publicity as well as writing articles for national magazines. In 2013, Sarah decided to bring together all her art contacts under one roof. 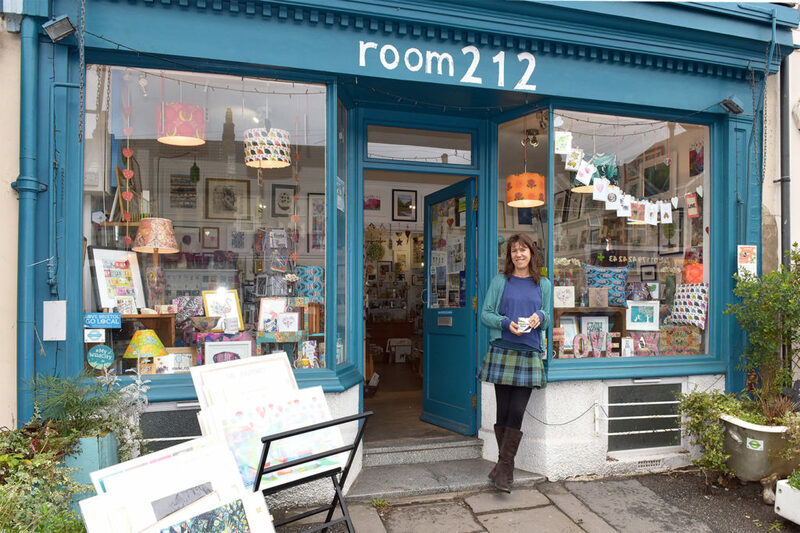 Room 212 was originally a pop up art gallery on Gloucester Road (the longest street of independent shops in Europe) and seemed the perfect setting. Her concept for Room 212 was to provide a hub for local artists, both established and emerging. Most of the artists help in the shop and this gives Sarah a chance to brainstorm ideas for the monthly themes, exhibitions and events for which Room 212 has become renowned. As a business owner and resident on Gloucester Rd, Sarah has been instrumental in creating Glos Rd Central, to promote the independent traders and community groups in the area and improve the street scene. She has helped put on events such as Mayfest, the North Bristol Art Trail and Gloucester Road Christmas Street Party. for the BCR Neighbourhood Partnerships and is a Champion for the Avon Wildlife My Wild City Project Avon Wildlife Trust She organised planters of flowers and shrubs out on the wide pavements of Gloucester Road funded by the local BCR Neighbourhood Partnership (for which she was the Trader Rep) http://www.bcrnp.org.uk/. Sarah was filmed during the installation which shown on BBC Springwatch Episode 12 in 2016. In 2014 Sarah was commissioned to create a painting for the second series of ITVs Broachurch. Her painting appeared in the Latimer’s house. The Broadchurch producers had visited Sarah in Room 212 and, under her direction, commissioned a painting by Huw Richards Evansand bought about 10 other prints and paintings from local artists in the gallery. Sarah is passionate about environmental issues and created the 212 Eco House to the rear of Room 212. This lovely little house was built with sustainable materials and has a flower filled garden, living willow hedge and 2 living roofs to encourage bees and other pollinators. All in all, Sarah Thorp has found herself at the forefront of a buzzing and creative scene in Bristol. Her energy and enthusiasm has ensured that Room 212 is a welcoming and eclectic showcase to the artistic talents of those around her and she loves every minute of being there!